Under EU No 571/2014 (F-Gas Regulation), European markets are experiencing the start of a drastic phase-down in the availability of HFC refrigerants (a reduction to 63% of the 2015 baseline figure). This is a steep reduction from the 93% availability in 2017, and the refrigeration industry is feeling the effects. For example, during the latter half of 2017 the price of R-404A increased by 700%. R-404A, with a Global Warming Potential (GWP) of 3,922 tCO2e, is not alone in seeing these exceptional price increases. It is one of a group of gases with a GWP of more than 2,500 tCO2e that will be banned from use in stationary refrigeration equipment starting in 2020 (with the exception of equipment designed to cool below -50°C). Additional refrigerants on this list of banned gases include: R-507, R-422A, R-422D, R-434A and R-428A. The rising prices are not restricted to these high GWP refrigerants. R-134a, with a GWP of 1,430 tCO2e, has also seen increases in the region of 400%. As illustrated in the following chart, a similar price increase is apparent for many other commonly used refrigerants, including R-407C and R-410A. 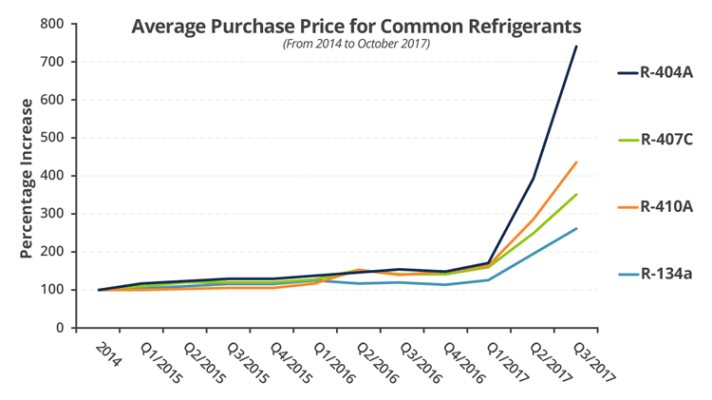 The 2018 reduction in HFC availability is expected to cause refrigerant prices to continue to trend upward. The lower GWP refrigerants (HFOs and HFO / HFC blends) replacing HFCs do not carry the same comparatively low price-tag to which the HVAC-R industry has become accustomed. Higher refrigerant prices are expected to become a global phenomenon as producers struggle to meet end-user requirements while maintaining their production quota.